ILA ADA was one of my favorite breakfast item when I was a kid. I'm sure every mallu kid might used to love it or still loves it. It is traditionally made by grinding the soaked par-boiled rice with very less water in a manual stone grinder called 'Ammi Kallu' to a smooth dough, then rolled into roti by pressing with your hands on top of banana leaves with sweet stuffing inside and steaming it. On weekdays my grand-mom used to be busy with daily chores of getting us all ready to school, packing breakfast, lunch etc for us and I remember Ada was made on weekend at our ancestral home as it requires a lot of manual labour. It is also known as Ottada in the North Kerala-Kannur, and I always wondered why it is known as Ottada since I have never seen it being made in any Ottu Paathram - a bronze metal vessel such as 'Uruli/Ottu Uruli'. According to my grand-mom - in her early days Ottada/Ada was made in manchatti - a claypot or earthen ware by wrapping the spreaded rice dough in banana leaves and with sweet coconut stuffing. Since the clay pot is made of Odu ie Clay it was called Ottada. I could only imagine it as she tried to make me feel the smell of the Ada being cooked in manchatti, banana leaf ohhh my, gone are those days. As she continued saying our favorite Puttu- a kind of steam cake used to be made in Chiratta ie in coconut shell. Friends that is one of the reason our grandma's food used to be the best as they used to put all the effort by cooking them the authentic way. The Ammi - manual grinding stone, chiratta - coconut shell, Ila - banana leaves, Plavila - Jackfruit leaves, every single thing has its own fresh smell which adds up taste and smell to the dish. I wonder if my kids will ever be able to feel/understand all these, which I have at least seen few, can imagine some and try to implement little bit. ILA(banana leaf) Ada as the name says is made in ILA/banana leaf and it has great smell of steamed banana leaf. 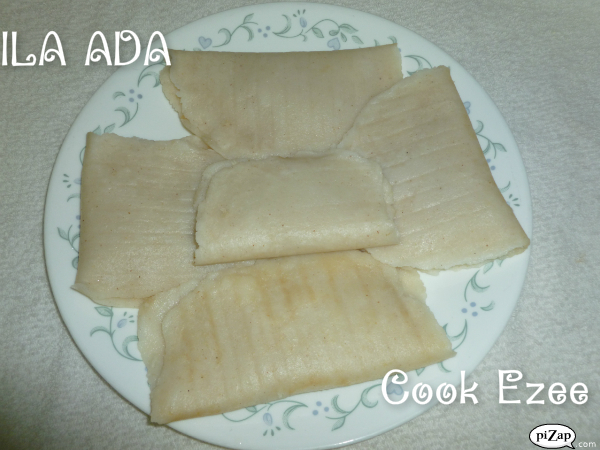 I found some frozen banana leaves in the Asian stores and tried making Ada with it. But somehow I didn't like the taste of that Ada. My brother-in-law suggested me the idea of making Ada in silver foil and since I didn't get fresh banana leaves in US I thought of trying it out. Even though I didn't get the feel of the fresh banana leaves it came out good with its authentic taste which I always admired. So here we go with the silver foil version of Ada. Enjoy!!!!! Note:- If you get the fresh banana leaves please make it in the banana leaves. That really tastes good. Dearies, Adding recently taken Ada pictures. This was made in banana leaves since I happened to get some fresh banana leaves.